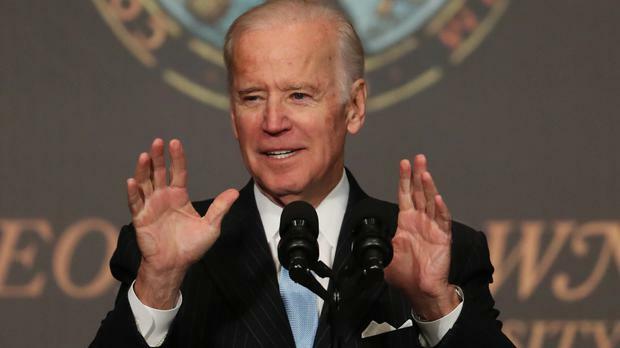 US vice president Joe Biden has continued his coy approach to a possible 2020 presidential bid. The Democrat told Stephen Colbert on CBS's Late Show: "I don't plan on running again, but to say you know what's going to happen in four years is just not rational." He added: "I can't see the circumstance in which I'd run, but what I've learned a long, long time ago, Stephen, is to never say never." The comments came a day after Mr Biden said, with a slight smile to a reporter, "I'm going to run in 2020." Mr Biden told Colbert his decision not to run in 2016 was right for his family, even though he was "best prepared at this moment to lead the country".